On a lookout for a book to gift someone, after a very long day at the office, I decided to head to a bookstore. Upon entering, I was greeted with a big fat book sale! Just so you know I didn't find the particular book I wanted to gift, but an hour and a half of browsing later, I did walk out with three for myself. All books by my favourite author Alexander McCall Smith. 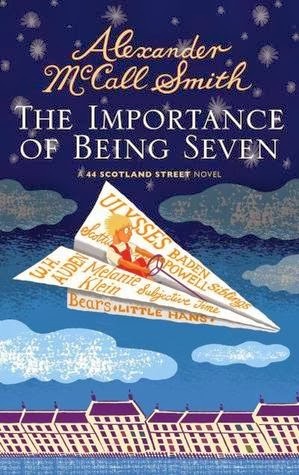 One of the titles was 'The Importance of Being Seven'. Like the caption of the title says (A 44 Scotland Street Novel), it draws out for you days in the life of residents on a street in Scotland. If like me you've never visited Scotland but would very much like an insight into the place and its people, this one's a great handbook! Smith very vividly spins a tale about people who are in the pursuit of bettering their life, enjoying the little things, dreaming, planning their travels and of sometimes harbouring negative thoughts about others (even close ones). Bertie, the boy cutely illustrated on the book cover is an adorable character who yearns to turn seven. His life around his imposing mother seems a bit suffocating, and he looks forward to spending simple moments with his dad such as going fishing and camping with him, asking his dad about the marvels of the world. The book also details an incident when his mum Irene goes missing. Neighbours who not necessarily like Irene speculate about the reasons one of them being her eloping with another man. Inside, Bertie cherishes the time around his dad in the absence of his mum and some think even his dad Stuart is happier without Irene. But Smith reveals she was accidentally locked inside a shipping container headed to Romania! Indeed, humour is Smith's best friend when it comes to storytelling. The reader also gets in insight into Bertie's troubled school life. His days in the classroom are jerky owing to friends like Tofu who hurl mean jibes at him and his family. Then there's Matthew who so loves his pregnant wife Elspeth and the saga over him moving out of the modest India Street and purchasing a swanky new expensive home where the rumour is that the structure is supported by a Chinese closet which if moved will lead to the entire house crumbling down! You will even learn what Stendhal Syndrome is and how Antonia is a victim of it during her trip to Italy in the company of her two friends Angus and Domenica who decide to get married there. One of the things that charms about Smith's stories are his moral takes on simple things like just because we meet a friend before someone else, does that give us more right over that person? Something to chew on right? Think no further, pick up this book and tuck into the delightful stories.